PTAS has implemented a comprehensive suite of policies to demonstrate our commitment to a safe and healthy workplace, whilst contributing to a sustainable environment and delivering quality, cost effective products & services on-time for our customers. PTAS has adopted and published company polices as best practice standards that we can all embrace. We choose to keep them top of mind by having them displayed at the entry to our facilities, with printed versions available on every worksite. 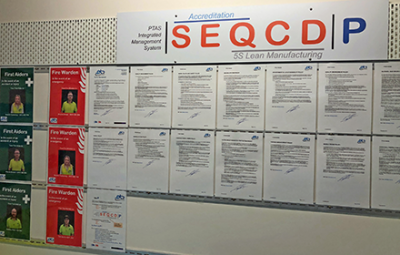 Our policies are in place to support our SEQCD|P Management System. They form an important part of our new employee induction sessions, because they document the framework of how we work at PTAS and provide an opportunity to share our expectations. Managers and supervisors have responsibility for implementing and overseeing policies; they may delegate some duties and activities to team members and may be improved or added to via a collaborative process.